The summer after my freshman year of college, I became a saleswoman for Cutco cutlery. One day I was 19, broke and aimless, living at home and trying to earn beer money without working too hard. The next I was in a stale office, slowly grasping that the marketing position I’d seen advertised on a telephone pole actually involved selling parers, peelers, and steak knives out of my car. I probably should’ve seen it coming. A telephone pole isn’t a job board. I took the gig anyway. Cutco is an American cutlery company created in 1948 by Wear-Ever Aluminum. Based in upstate New York—where you can stop by the visitors’ center or drop off your knives for sharpening—the company is known for its distinctive curvy handles, D-shaped serrated blades, and the army of awkward collegiates who hawk the knives to unsuspecting friends and neighbors. Ask around at your next office happy hour or lunch meeting. Odds are, someone has sold Cutco. The brilliance of Cutco’s strategy lay in its exploiting those personal relationships. Years before Facebook was mining our social networks for data to sell to advertisers, Cutco was doing the same to find potential buyers. Today you can purchase Cutco online, but back then the company’s customer base was essentially its sales reps’ address books. Who cares if your neighbor, aunt, or classmate’s mom is only purchasing out of pity? The important thing is that they buy. 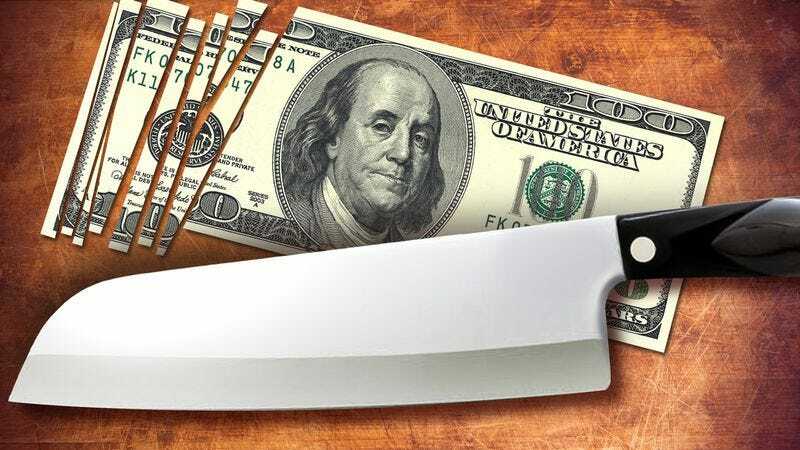 When I was working, the average sale was around $50, about the price of a single Trimmer knife—just enough to fulfill that sense of obligation. The other reason Cutco works is that, by and large, most people know nothing about knives. Unless they’re an aspiring chef or serious home cook, they consider their cutlery about as often as they do their socks. By the time I arrived at the front door, my clients had grown so accustomed to sawing away with dull, blunted blades, that whatever I presented seemed like a countertop miracle. Why else would they let some teenager whose greatest culinary achievement was scrambled eggs sell them something they already owned? Cutco isn’t alone in exploiting our ignorance. Ever since Ginsu sliced its way through a tin can and into America’s hearts in 1978, infomercials have preyed on bored housewives and insomniacs, convincing them to trash perfectly good knives in favor of something that could cut a pineapple in two. From Ron Popeil’s Showtime Six Star+ to the Magic Bullet, these never-dulling slicers and dicers could be yours for just three easy payments of $13.33. No sharpening—or research—necessary. I started my summer of Cutco the way all of its employees do: learning about full tangs (when the blade extends the length of the handle), studying competing brands, and—most importantly—memorizing the sales script. I learned to ask about my clients’ cooking habits, to explain Cutco’s ergonomic handle (available in black or white! ), and to show off the patented “Double D” serrated blade with three distinct recessed cutting edges. “Can you sharpen it?” people would ask. I’d have customers grab their go-to kitchen knife and ask them to struggle through pieces of thick rope and leather. Then I’d watch their eyes go wide as a brand new Cutco blade slid through these things effortlessly. “This is what cutting should feel like,” I cooed. I scolded their wood-handled knives with their disgusting, bacteria-laden cracks. I talked about the dangers of dull cutlery. I commiserated over bad knives that tore up loaves of bread and squished tender tomatoes, and marveled at the time you could save by just having a knife that works. Finally, I’d reach into my vinyl bag of tricks and retrieve the kitchen shears (which come apart for easy cleaning!). I’d dig a penny from my purse and trim the coin into a tiny corkscrew. Why? Just for show. I’ve never known any home cook to cut coils out of spare change, but the idea that you could was key to creating the desire for something more. Everyone who works for Cutco gives essentially this same spiel, touting the same features and extolling the same perks. But while my peers were earning the base $16 per presentation, I was hitting sales benchmarks and watching my commissions tick steadily upward. At first, every sale felt like a surprise. But somewhere along the way I had a sickening realization: I was good at this. I sold a lot of knives that summer, to people with whom I made fleetingly personal relationships. There was the woman who bought a sizable set, then gave me the names and phone numbers of 25 friends. There was a wife who’d settled on a handful of pieces, until her husband retrieved a dusty box of vintage Cutco from the basement. There were out-of-town cousins who ordered over the phone, then complained about cutting themselves when they did the dishes. Some of my customers dropped hundreds of dollars on sparkling Cutco. Some picked up just a piece or two. Some bought nothing at all. But they all had one thing in common: They already owned knives. Even as I complimented their kitchens, explained how my own mom had been using Cutco for years, and turned the charm up to 11, I knew the people in front of me didn’t need a whole new set of cutlery. All they needed was a $5 sharpening steel to go to work on the knives they already had. But people are lazy, and I wanted the money. I took their orders anyway. A few weeks later, a friend of my mother’s called, asking me to come over and bring my knives. “We’re not going to buy anything,” she cautioned, but her daughter loved to cook, and she thought it’d be fun to catch up over Cutco. We prepped dinner together, dicing tomatoes and chopping onions, as I gave a casual demo for her and the kids. She even placed an order. It was more than I’d expected, but she seemed genuinely excited, and I walked out feeling good about the night and the job. That feeling—of preying on people’s inexperience and impulsiveness—was a familiar one. There was always something fundamentally uncomfortable about the Cutco model, something invasive about walking into a person’s home, sitting at their kitchen counter, and convincing them to buy something totally unnecessary. Perched on the edge of a wooden chair in wilting polyester, I felt like I was betraying an unspoken intimacy, violating the sacred space where families gather to eat and connect. But I’d shake off the discomfort and reach into my bag. The truth is, I still like Cutco knives. They’re still the ones I pull from the block at my folks’ house, and I still like the way they feel in my hand. But I drove into the office the day after that last presentation and I quit. My boss barely shrugged. What did he care? An army of undergrads was still out there, working the streets and the phones, spreading the Cutco gospel across the greater Boston area to impressionable friends and family, converting them to Cutco owners one $50 in-home sale at a time.